A sambar made primarily with small onions & freshly prepared masala. A different kuzhambu with mixed taste of sesame seeds & tinge of pepper. 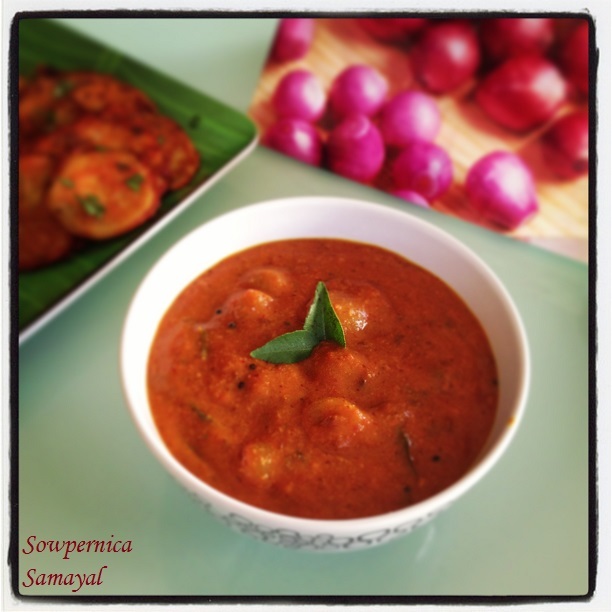 A thick gravy comprising of a combination of vegetables cooked in a fresh ground masala. Aromatic gravy with freshly ground masala. A nutritious & tasty kuzhambu with spinach. Can be served with hot rice/served as a side eat. A nutritious rice accompaniment with the goodness of spinach. A kuzhambu perfect make when you have a cold/body ache/ winter season, made with a dash of medicinal spices. A kuzhambu with all the goodness of pepper. A buttermilk based kuzhambu made with soaked & ground masala. A tasty kuzhambu made with omam (ajwain), aids in digestion. A tangy kuzambu with soaked dal balls. A delicious & nutritious gravy packed with loads of vegetables. A festival make, made on the occasion of festival called 'thiruvadarai' & hence the name. A delicious kuzambu with all the goodness of fenugreek. A kuzhambu made with buttermilk & fenugreek seeds.